Questions About Barack Obama's status as a "natural born citizen" - Truth or Fiction? Questions About Barack Obama's status as a "natural born citizen"
A variety of articles and lawsuits that question whether Barack Obama is eligible to be President of the United States based on his citizenship. Update May 23, 2012: The State of Arizona sent investigators to Honolulu, Hawaii to verify the birth certificate of Barack Obama before the Grand Canyon State would allow his name on the ballot for the November 2012 election. Special assistant to Hawaii Attorney General David Louie, Joshua Wisch, told the Associated Press that Hawaii has provided the verification that Arizona was looking for and “that the matter was resolved.” This according to a May 23, 2012 article on the Fox News web site. Arizona Secretary of State Ken Bennett said today that, “he received information from Hawaii that proves President Obama’s American birth and satisfies Arizona’s requirements for having the president on the upcoming election ballot,” according to a May 23, 2012 Fox News article. Update April 27, 2011: The White House released what it says is the long-form birth certificate of President Barack Hussein Obama and said it proves that the president was born in the state of Hawaii. This development came after a series of television appearances of Donald Trump who is considering a run for the Oval Office and has repeatedly questioned the origins of Obama. Adams said that during the 2008 campaign there were questions of Barack Obama’s constitutional eligibility to run for President that the elections office was overwhelmed with requests to verify his birthplace. Adams made some inquiries and was informed by his boss that there was no record of the birth for candidate Obama. Update December 21, 2009: Dr. Orly Taitz is an attorney who filed a lawsuit in Southern California questioning the authenticity of the birth certificate of President Barack Obama. The lawsuit was filed on the day Obama was sworn into the office of the President. Dr. Taitz told TruthOr Fiction.Com that the latest version eRumor involving Supreme Court Justice Scalia is a fabrication. Taitz filed a case with the US Supreme Court but was told by clerks that the case would have to be heard at a lower levels of our justice system. Dr. Taitz has a blog posted for those interested in following this case which was originally scheduled to be heard in January 2010. There have been numerous attempts to hack Taitz’s blog site and in October 2009, the Search Engine Google posted a warning about the possibility of spy-ware infection from the site before directing web-surfers to the link at their own risk. Update October 29, 2009: The Associated press reported on October 29, 2009 that U.S. District Court Judge David O. Carter dismissed the case in Santa Ana, California. In a written statement, Carter said that the court cannot “sweep away the votes of over 68 million Americans with the stroke of a pen, ” and “that the U.S. Constitution does not give the court jurisdiction to decide the matter.” Dr. Taitz is currently in the process of filing appeals. Click for Associated Press Story. Update May 5 2009: A new Obama citizenship story story claiming to be from the Associated Press saying that a group called “Americans for Freedom of Information” released copies of Occidental College transcripts showing that the “Fulbright Foundation” had awarded Barack Obama, under the name of Barry Soetoro, financial aid to attend Occidental College. This claims to be the “Smoking Gun” to the rumor about his natural born citizen status. The eRumor began circulating in April 2009 and by the end of the month reached critical mass. There is no such story by the Associated press and looking at the dateline this appears to be an April Fools joke. An Occidental College spokesperson told TruthorFiction.com that President Obama’s records are still sealed and no such transcripts have been released. When asked if the future President used the Obama or Soetoro name at the college, the spokesperson said that although he had not seen the sealed transcripts he had seen a 1981 photo book that was handed out to students and faculty at the beginning of the college year with student photos, names and hometown information. The 1981 photo book had “Barack Obama” under the student’s photo and indicated a home state as Hawaii. There is no “Fulbright Foundation” but there is a Fulbright program that is sponsored by the US Department of State and does award scholarship grants to students working towards higher degrees who already have a Bachelor of Arts degree. The program was established in 1946 under legislation introduced by late Senator J. William Fulbright of Arkansas and each year awards approximately 7,500 grants. The grants are for both American students who want to study abroad and foreign students who want to study in the US. To be eligible certain criteria must be met. Click for Fulbright information. The Obama citizenship story began circulating during the 2008 presidential campaign and attracted a lot of interest, but on October 24, 2008, the judge in the case dismissed the lawsuit saying that the man who filed it lack standing and that any harm from an allegedly ineligible candidate was “too vague and its effects too attenuated to confer standing on any and all voters.” Attorney Phillip Berg has announced that he will be appealing the dismissal of his case to the United States Supreme Court. An online petition has been set up by “Rally Congress”, a non profit group “dedicated to helping people and groups communicate more effectively with elected officials”, they say that they have collected over 108,000 signatures and letters. These numbers have grown considerably since the election. Click for petition. On November 18, 2008, the America’s Independent Party (AIP) announced that Presidential candidate Alan Keyes and the party have filed a law suit with the California Superior court to keep Secretary of the State of CA, Debra Brown, from certifying the names of the electors to Governor Arnold Schwarzenegger, until proof of Barack Obama’s U.S. Citizenship is verified. Click for AIP release. On November 1, 2008 the Associated Press released a report saying that state officials in Hawaii “have personally verified that the health department holds Obama’s original birth certificate.” Hawaiian Health Department Director Dr. Chiyome Fukino and Alvin Onaka, who is the registrar of vital statistics both reviewed the original document. The suit had been filed by Philip Berg , a Pennsylvania attorney who described himself as a lifelong Democrat, the former Democratic Chairman of Montgomery County, Pennsylvania, an 8-year member of the state democratic committee, a former Deputy Attorney General of Pennsylvania, and a past candidate for both governor of Pennsylvania and United States Senator. Berg filed the suit in federal court on August 21, 2008 claiming that Barack Obama was not eligible to be president of the United States because he was not a “natural born” citizen of the United States, which is required by the Constitution. He asked that the court demand Obama and the Democratic National Committee to provide documentation proving he was eligible to be president.. He also asked for a temporary restraining order asking that Obama’s campaign be halted. At issue was whether Barack Obama was ever an American citizen by birth, even if he is an American citizen whether he was a “natural born” citizen as the constitution requires for the president, and whether he ever lost his U.S. citizenship and, if so, whether he ever got it back. An Internet video began circulating based on an interview with Berg. It was titled October Surprise and outlined Bergs contentions about Obama’s birth. 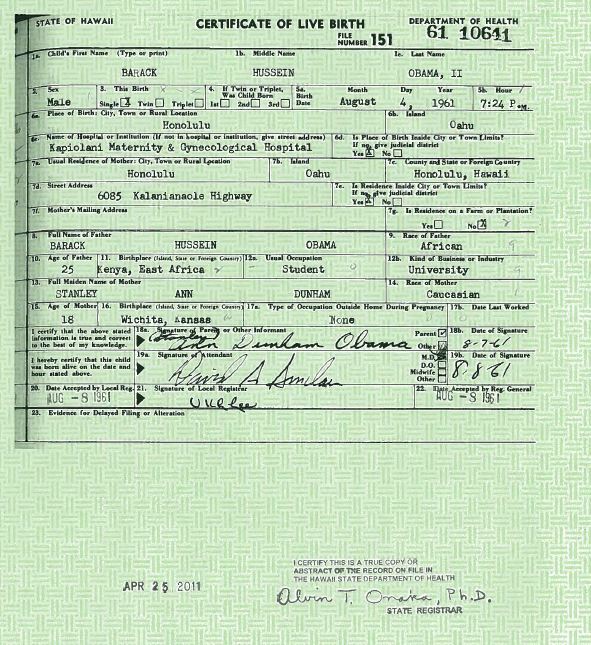 That Obama was not born in Hawaii, as he claims, but was actually born in Kenya, his father’s homeland. That Obama’s mother was in Kenya in the late stages of her pregnancy and airlines at the time would not let her fly back to Hawaii at such an advanced time of pregnancy. That Obama’s grandmother on his father’s side, a half brother, and a half sister all say Obama was born in Kenya. In October, 2008, Berg announced that he had a recording of the grandmother talking about the birth and that she was in the birth room when it took place. That Obama was born on August 4, 1961 but his birth was not registered in Hawaii until August 8, 1961 and that the registration and a Honolulu newspaper announcement of the birth were fabricated. That there is not agreement in Obama’s family about what hospital in which he was allegedly born in Hawaii. 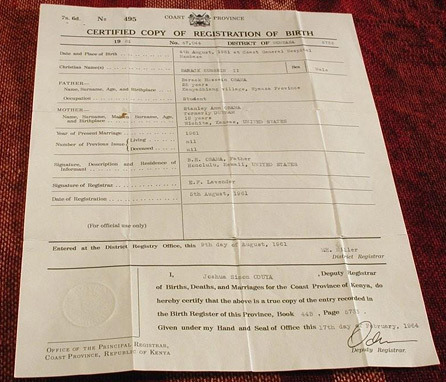 That according to Wayne Madison, a journalist with Online Journal, a GOP research team sent to Mombosa, Kenya, found a certificate registering the birth of Barack Obama, Jr. at a maternity hospital indicating his birth to a Kenyan father and a U.S. mother. That if he was born in Kenya, he cannot be a U.S. citizen because the law stated that his mother would have had to have lived 10-years in the United States, 5 of which were after the age of 14. Since she was 18 at the time of Obama’s birth, she did not meet the residency requirements for passing U.S. citizenship to Obama. That when Obama’s mother married an Indonesian man and took Obama to Indonesia when he was 6-years old, he would have lost his U.S. citizenship and become Indonesian. Indonesia at the time did not recognize dual citizenship. That when Obama was registered to attend school in Indonesia, the registration form listed him as “Barry Soetoro” (his stepfather’s last name), listed him as Indonesian, and listed is faith as Islam. That according to the law at the time, Obama’s mother would have lost her U.S. citizenship by marrying an Indonesian and living in Indonesia. Four years later she returned to Hawaii and divorced her Indonesian husband. Berg said that she could have regained her U.S. citizenship by taking an oath of allegiance to the United States but that there is no record that she did. Therefore, Obama would not have been able to regain his own citizenship until the age of 18 and himself take an oath of allegiance to the U.S. Berg said there is no record of that ever happening. Berg concludes that not only may Obama not be eligible to be president, but that he may be an illegal alien. That Obama traveled to Pakistan at the age of 20 and traveled using an Indonesian passport. Had he regained his U.S. citizenship, according to Berg, he would have traveled using a U.S. passport. 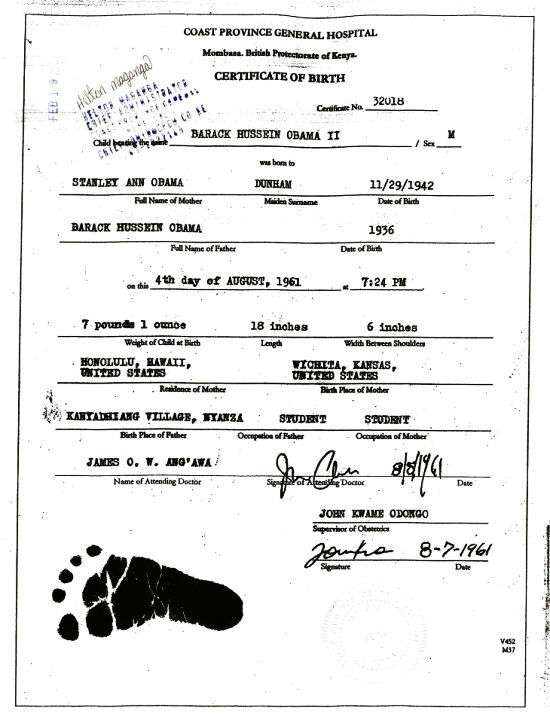 In response to questions about his birth, Obama posted a birth certificate on his campaign website, but Berg contends that it is a forgery and that forensic experts have determined that it is a altered version of the birth certificate of Obama’s half sister, Maya Kasandra Soetoro, who was born in Indonesia but whose birth record was also forged to make it appear that she was born in Hawaii. That when Obama registered for the Illinois Bar he lied and said “none” when asked about any former names. Berg said that Obama’s lawyers were dragging their feet in providing proof of Obama’s birth and citizenship and that means “he’s a total fraud, he’s a phony, and that means he should be arrested, tried, and deported. An eRumor got started at the beginning of October 2008, saying that the judge in the Berg case, had issued an order for Obama to produce his original birth certificate, but that was false. An article by Jon Dryer was posted on NewsWithViews.com, which has since been retracted. In it, Dryer claimed that Judge R. Barclay Surrick had made a decision in the case and had ordered Obama to present the court with evidence that he is an American citizen. The Berg lawsuit was the latest in a series of challenges about the birth of the Democratic nominee for president, which he lists as having taken place in Hawaii on August 4, 1961. The first was an eRumor that said that Hawaii was not a state when he was born so therefore he is not a “natural born” citizen. That one was Fiction! Hawaii was a state in 1961 and it would not have mattered because prior to that it was a U.S. Territory, which would have still qualified him as “natural born.” CLICK for more on that story. The most detailed forensic investigation was posted on Atlus Shruggs, a conservative website by Pamela Geller. The investigation was done by a self described forensics expert who goes by the screen name of Techdude, but he has not been identified nor has his credentials been confirmed. Click here for report. Jerome Corsi, the controversial conservative author of the book The Obama Nation has said in TV interviews that he believes the birth certificate is phony. He made a trip to Kenya in 2008 and told WorldNetDaily that he, too, was told that Obama was born in Kenya but when he tried to gain access to official documents about Obama’s birth, he was told they had been sealed. Click for Berg Press release and up to date progress of the case. 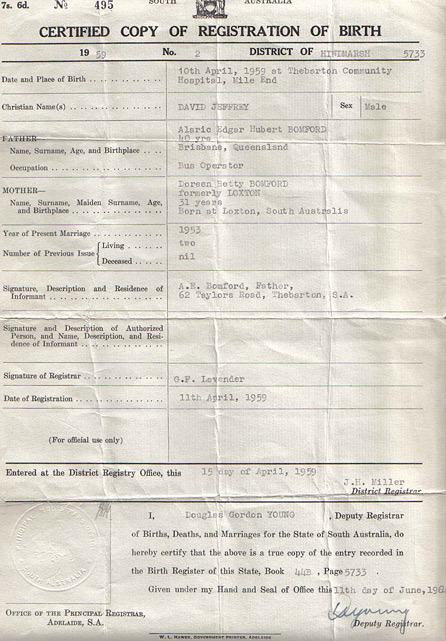 Above: The first image is a real certified copy of registration of birth from Australia. The second image appears to be the same document doctored up to look like it came from Kenya. At the time of Obama’s birth Kenya was was still under British possession and it was not until 1963 that it became an independent republic. 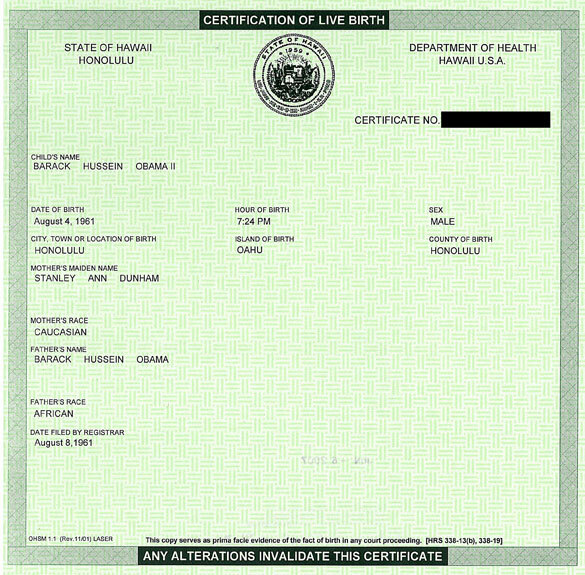 In a June 14, 2011 article by Jerome Corsi of World Net Daily it was revealed that radical supporters of Barack Obama have finally admitted to the forgery of the above Kenyan birth certificate. There is now a website where people can generate their own Kenyan birth certificate just like the one that was fabricated for the President. Click for Kenyan Birth certificate generator. Above: Alleged Certification of Live Birth posted on Obama’s Fight the Smears website in 2008. 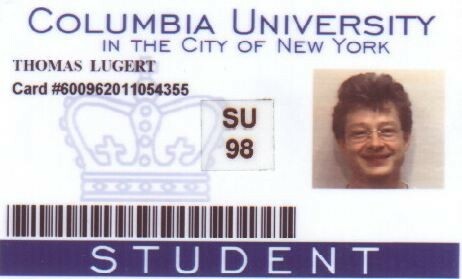 We have determined that an image of a foreign student identification card bearing Barack Obama’s name and photograph to be a forgery after the original image was found posted on the website of Thomas Lugert in Germany. Click for website. constitutionally ineligible to run for and hold the office of President of the United States. Phillip Berg, the filing attorney, is a former gubernatorial and senatorial candidate, former chair of the Democratic Party in Montgomery (PA) County, former member of the Democratic State Committee, and former Deputy Attorney General of Pennsylvania. According to Berg, he filed the suit–just days before the DNC is to hold its nominating convention in Denver–for the health of the Democratic Party. Berg cited a number of unanswered questions regarding the Illinois senator’s background, and in today’s lawsuit maintained that Sen.
calls “dual loyalties” due to his citizenship and ties with Kenya and Indonesia. Even if Sen. Obama can prove his U.S. citizenship, Berg stated, citing the senator’s use of a birth certificate from the state of Hawaii verified as a forgery by three independent document forensic experts, the issue of “multi-citizenship with responsibilities owed to and allegiance to other countries” remains on the table. according to the l awsuit, Obama’s mother traveled to Kenya with his father but was prevented from flying back to Hawaii because of the late stage of her pregnancy, “apparently a normal restriction to avoid births during a flight.” As Sen. Obama’s own paternal grandmother, half-brother and half-sister have also claimed, Berg maintains that Stanley Ann Dunham–Obama’s mother–gave birth to little Barack in Kenya and subsequently flew to Hawaii to register the birth. Hospital and Queens Hospital–in Honolulu, as well a profound lack of birthing records for Stanley Ann Dunham, though simple “registry of birth” records for Barack Obama are available in a Hawaiian public records office. Should Sen. Obama truly have been born in Kenya, Berg writes, the laws on the books at the time of his birth hold that U.S.
citizenship may only pass to a child born overseas to a U.S. citizen parent and non-citizen parent if the former was at least 19 years of age. Sen. Obama’s mother was only 18 at the time. Therefore, because U.S. citizenship could not legally be passed on to him, Obama could not be registered as a “natural born” citizen and would therefore be ineligible to seek the presidency pursuant to Article II, Section 1 of the United States Constitution. mother took up residency in Indonesia, where Stanley Ann Dunham married Lolo Soetoro, an Indonesian citizen. 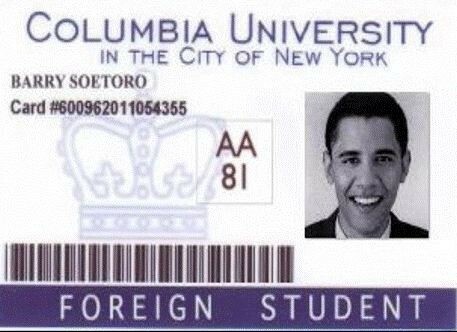 Berg also states that he possesses copies of Sen. Obama’s registration to Fransiskus Assisi School In Jakarta, Indonesia which clearly show that he was regi stered under the name “Barry Soetoro” and his citizenship listed as Indonesian. Reports quote information that certified copies of a Kenyan Birth Certificate (BC) for Obama were sent from Kenya, and have been received by three separate individuals. And that these documents are certified, with an embossed seal, and display the name of the hospital where Obama was born, as well as witness signatures. It has been asserted by a number of sources, including Andy Martin, that Barack Hussein Obama was born in Mombasa, Kenya and not in Hawaii. Philip Berg?s Latest Motion to the Court is more explicit since it gives an exact Place of Birth. I must assume that Berg did not simply pluck the Location out of thin air, Mombasa has more than one Hospital, though Coast Provincial General was the best in 1961. British Birth Certificates have a Standard Format which has been more or less the same since 1837 and they can only be challenged in a British Court. Kenyan Law is explicit and can only be challenged in a Kenyan Court. Indonesian Law is explicit and can only be challenged in an Indonesian Court. Be clear, if Obama was born in Kenya this is not simply a matter for the US Courts, or US Law. If he was born in Kenya, and his parents were Legally Married [which on the Preponderance of Evidence they were, his father’s first “Marriage” being a Tribal, or Village, Marriage, which was not Legally Recognized] due to the age of his mother he would NOT have been a US Citizen. The Immigration and Nationality Act 1952, 8 U.S.C. 1401. Sec. 301 (g) [Effective November 14, 1986] does not apply, nor does Title III, Immigration and Nationality Act Section 309. [8 U.S.C. 1409]. Unless he has taken the Oath of Allegiance as a Naturalized Citizen since he was 18 years old, and if he was born in Mombasa, Kenya, Barack Hussein Obama II would not be a US Citizen, period. The issue of whether or not he was Natural Born under Article II of the Constitution of the United States would cease to matter and he would need to be Deported as an Illegal Alien. Impeachment as a Senator would seem not to be necessary since he would never Legally have been one, but Diane Feinstein and the members of the Senate Ethics and Rules Committee would be liable to Impeachment. So would their opposite numbers in the Illinois Senate and the appropriate officials of the Illinois State Supreme Court and Bar, so far as I can see. If Senator Barack Hussein Obama II was born in The Coast Provincial General Hospital at Mombasa in Kenya at 7.24 PM on August 4th 1961, or at any other time, he is not a Natural Born Citizen of these United States and he never was. Philip J Berg, Esq, is correct, under the Nationality Act of 1940, as Revised June 1952 and in accord with United States of America vs Cervantes-Nava 281 F 3d 501 (2002) and Drozd vs INS, 155 F 3d 81, 85-88 (2d Circuit 1998) Senator Barack Hussein Obama II would not ever have been a Legal US Citizen at all, unless he was Naturalized. If he was born in The Coast Provincial General Hospital at Mombasa in Kenya any Certificate, or Certification of Live Birth, issued for him by the State of Hawaii is a Fraudulent and Illegal Document. At Birth he would have been a UK and Colonies Citizen and in accord with the Kenyan Constitution he would have become a Kenyan Citizen in December 1963. He would not have been a US Citizen. Alternatively, his UK and Colonies Birth Certificate issued in Mombasa in August 1961 could be a Fraudulent and Illegal Document. The two BCs would need to be compared. By this I mean the Original Vault Copy of the Hawaiian Birth Certificate and not the Amended, Post Adoption, Copy, Legally available to the Senator, assuming he was, as indicated by the Preponderance of Evidence, Adopted by Lolo Soetoro. This case might also need to go through the UK and Kenyan Courts and becomes a Matter of International Law and Controversy. Here is some breaking news that the MSM oddly enough is NOT reporting! Presidential candidate Alan Keyes, vice-presidential candidate Wiley S. Drake, and the Chairman of the American Independent Party, Markham Robinson, have filed suit in California Superior Court in Sacramento seeking to bar Secretary of State Debra Bowen from certifying to Governor Arnold Schwarzenegger the names of Electors, and from transmitting to each presidential Elector a Certificate of Election, until documentary proof is produced and verified showing that Senator Obama is a “natural born” citizen of the United States, and does not hold citizenship of Indonesia, Kenya or Great Britain. In addition, they have asked that the court issue a peremptory writ barring Senator Obama’s California Electors from signing the Certificate of Vote until such documentary proof is produced and verified. Lolo Soetoro, Stanley Ann Dunham Soetoro,baby Maya Soetoro, and 9 year old Barry Soetoro? In a move certain to fuel the debate over Obama’s qualifications for the presidency, the group “Americans for Freedom of Information” has released copies of President Obama’s college transcripts from Occidental College . The transcript indicates that Obama, under the name Barry Soetoro, received financial aid as a foreign student from Indonesia while an undergraduate at the school. This document provides the smoking gun that many of Obama’s detractors have been seeking – that he is NOT a natural-born citizen of the United States – necessary to be President of these United States. Along with the evidence that he was first born in Kenya, here we see that there is no record of him ever applying for US citizenship. Gary Kreep of the United States Justice Foundation has released the results of their investigation of Obama’s campaign spending. LET OTHER FOLKS KNOW THIS NEWS – THE MEDIA WON’T ! FEDERAL JUDGE Carter sets Trial Date for Obama’s Eligibility!!! The expedited trial has been set for Jan. 26, 2010, just 4 1/2 months from now I and many other concerned veterans and citizens attended the hearintoday in Federal Court in Santa Ana in the lawsuit against Barack Obama to determine his eligibility to be President and Commander in Chief.. About 150 people showed up, almost all in support of the lawsuit to demand that Obama release his birth certificate and other records that he has hidden from the American people. Judge David Carter refused to hear Obama’s request for dismissal today, instead setting a hearing date for Oct. 5, 2009 since Obama’s attorneys had just filed the motion on Friday. He indicated there was almost no chance that this case would be dismissed. Obama is arguing this lawsuit was filed in the wrong court if you can believe that. I guess Obama would prefer a “kangaroo court” instead of a Federal court! Assuming Judge Carter denies Obama’s motion for dismissal, he will likely then order expedited discovery which force Obama to release his birth certificate in a timely manner (if he has one). The two U.S. Attorneys representing Barack Obama tried everything they could to sway the judge that this case was frivolous, but Carter would have none of it and cut them off several times..
Obama’s attorneys left the courtroom after about the 90 minute hearing looking defeated and nervous. Judge Carter practically guaranteed it! Video from the press conference after the hearing coming soon. Congratulations to plaintiffs attorney Dr. Orly Taitz! She did a great job and won some huge victories today. She was fearless! AP- WASHINGTON D.C. – In a move certain to fuel the debate over Obama’s qualifications for the presidency, the group “Americans for Freedom of Information” has Released copies of President Obama’s college transcripts from Occidental College . Released today, the transcript school indicates that Obama, under the name Barry Soetoro, received financial aid as a foreign student from Indonesia as an undergraduate at the The transcript was released by Occidental College in compliance with a court order in a suit brought by the group in the Superior Court of California. The transcript shows that Obama (Soetoro) applied for financial aid and was awarded a fellowship for foreign students from the Fulbright Foundation Scholarship program. To qualify, for the scholarship, a student must claim foreign citizenship. This document would seem to provide the smoking gun that many of Obama’s detractors have been seeking. Along with the evidence that he was first born in Kenya and there is no record of him ever applying for US citizenship, this is looking pretty grim. The news has created a firestorm at the White House as the release casts increasing doubt about Obama’s legitimacy and qualification to serve as President. Justice Antonin Scalia announced that the Supreme Court agreed on Tuesday to hear arguments concerning Obama’s legal eligibility to serve as President in a case brought by Leo Donofrio of New Jersey . This lawsuit claims Obama’s dual citizenship disqualified him from serving as president. Donofrio’s case is just one of 18 suits brought by citizens demanding proof of Obama’s citizenship or qualification to serve as president. While I’ve little interest in getting in the middle of the Obama birth issue, Paul Hollrah over at FSM did so yesterday and believes the issue can be resolved by Obama answering one simple question: What passport did he use when he was shuttling between New York, Jakarta, and Karachi? A: No.. It is not possible. Pakistan was on the U.S. State Department’s “no travel” list in 1981. If he were traveling with a British passport that would provide proof that he was born in Kenya on August 4, 1961, not in Hawaii as he claims. If he were traveling with an Indonesian passport that would tend to prove that he relinquished whatever previous citizenship he held, British or American, prior to being adopted by his Indonesian step-father in 1967. Whatever the truth of the matter, the American people need to know how he managed to become a “natural born” American citizen between 1981 and 2008.. If you Don’t care that Your President is not a natural born Citizen and in Violation of the Constitution, then Delete. If you care then Forward! (f) certified copies of any court orders or legal documents changing his name from Barry Soetoro. These allegations will not go away until Mr. Obama produces proof to federal authorities and the public. If he will not do so voluntarily he must be compelled by every means available. You, as an employee of The People, have sworn an oath to support and defend the Constitution. We The People are demanding you to make every effort, both public and private, to resolve this fundamental Constitutional question before 20 January. European Newborn Babies Will Be Microchipped From May 2014-Fiction! San Diego County Officials told pastor that he can not hold a Bible study in his home without a permit -Truth! but Decision Reversed!